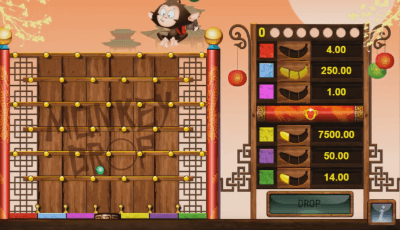 Monkey Drop is an amazing combination of gambling and a colorful eastern cartoon which captivates you from the first seconds. Blossoming sakura will bring you not only the pleasure of playing, but also good winnings on your bank card. We recommend you play "Monkey Drop" at least once, If you really like the eastern theme and you love monkeys. In addition, the developers have made the sizes of rates not so big, what will be a pleasant surprise for novice players. You will get 7 balls for each bet so we hope it should be enough to fill out the winning bananas and win up to 150.000 coins. It is worth noting, that not all casinos can boast of the presence of this game at the moment. This is the prerogative of only modern and successful online casinos. Here we mean well-known PlayOLG online casino. Visit its website, and try your luck in the newest online games from the best software producers. The whole gameplay is based on cunning and agile monkeys who throw colored balls. Your main task is to press the button in time and release the ball in the right place. The main purpose of these colored balls is to fall on the field, of a certain color. There are changes in the form of bananas, on right on the special panel, if the ball falls on the required field. The more balls fell on the required field, the more the corresponding banana is filled with color. When the banana is completely filled, you get winning money. The whole fascinating process is accompanied by cheerful eastern music, which will not let you get bored during the game. Each successful fall of the balls is accompanied by pleasant sounds. In general, it should be said that all graphics and soundtracks are performed at a very high level, which corresponds to the level of the IGT company. How to get the desired bonus? The process of transition to the bonus level is very simple. You need to make sure that any of the balls hit the central field, which is depicted in the form of a wooden box. Three sleeping monkeys will appear in front of you, as soon as you reach the bonus level. Wake them up with a gong and get bonus points. It's especially funny to look at the frightened faces of monkeys after awakening. After the monkeys wake up, the game will return to the previous mode. The slot which we reviewed above, is a successful and good performance of “IGT”, without a doubt. Eastern themes attract many fans of exotic and this slot miraculously meets all these requirements., You should just try to play this colorful and exciting game, even if you are not an admirer of the culture of the East.